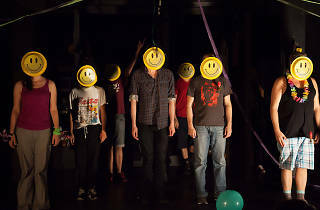 The New York Neo-Futurists may be the hardest working theater group in the city right now. 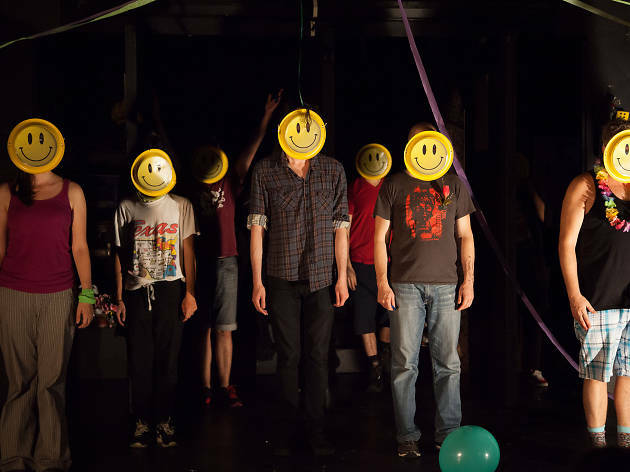 At a time when tickets are prohibitively expensive on Broadway and Off, the Neo-Futurists energetically return to their roots as an affordable, interactive and youthful opportunity to have a good time in a common space. The Infinite Wrench is a new series for the group, a departure from Too Much Light Makes the Baby Go Blind (which was recently revoked by the company’s founder in order to reshape the future work of Neo-Futurists to be more activist). Those familiar with past shows will recognize some DNA The Infinite Wrench shares with its predecessor, including the iconic “clothesline” that has become a trademark. This on-the-fly method drives the spirit of improvisation, as fragments from previous shows can bubble up onstage and provide tools (or even obstacles) to those onstage. None of the cast lets themselves off easy; everything has the feeling of being slightly under-rehearsed and spur-of-the-moment, so it requires laser-like focus and constant invention. Plays are allowed to go wrong—and do—and the resulting lack of polish creates a safe space for us, the audience, to unwind and have fun. Over the course of the evening, we experienced touching monologues, light shows, contests, and songs. They covered everything from Mitch McConnell and “building the wall” to incongruity and LGBTQ+ visibility. The entire night fell somewhere between beer-soaked Charades with friends, a Japanese game show and the final night of an improv competition. It is difficult to explain, except as a great way to spend a Friday or Saturday night. The Infinite Wrench runs every weekend (except the last two weeks of December) at the Kraine Theater, Friday & Saturdays at 10:30pm. Tickets bought at the door begin with a base of $13 + the roll of a 6-sided die ($14-$19). Tickets purchased in advance are $19 plus a $2 fee. More details here. Taya is a Digital Content Producer at Time Out. She’s really good at claw machines and really bad at pool. Follow her on Instagram @tayarkenny.